For over 35 years K&N has manufactured serious air filters completely unlike traditional disposable filters. 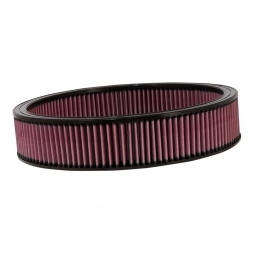 Their air filter is designed to achieve high, virtually unrestricted air flow while maintaining filtration levels critical to ensure long engine life. The secret to their success lies in the unique characteristics of their filter medium that was originally developed by K&N all those years ago in the dust, sweat and tears of desert motocross racing. They just wanted to win races and stumbled on a cotton filtration technology destined to be great. Their high flow cotton gauze air filter is washable, reusable and built to last for the life of an automotive engine. The filters consist of four to six sheets of cotton gauze layered between two sheets of aluminum wire mesh. This media is then pleated and oiled to enhance its filtering capabilities and overall performance. The result is an air filter that allows dramatically more air into an engine, is washable and reusable, and will protect your engine for the life of your vehicle.